Last night, I needed a no-fuss dinner as I just wasn’t in the mood for cooking something elaborate. I found some chicken thighs and legs in the freezer, and once they were defrosted I found this recipe online, which I amended slightly. It’s a great quick-fix dinner and it is absolutely delicious with very few ingredients! I only decided to blog this recipe after eating everything, which is why the photo isn’t as good… but trust me, it tastes waaayy better than it looks! Take the head of garlic, separate the cloves and peel them. 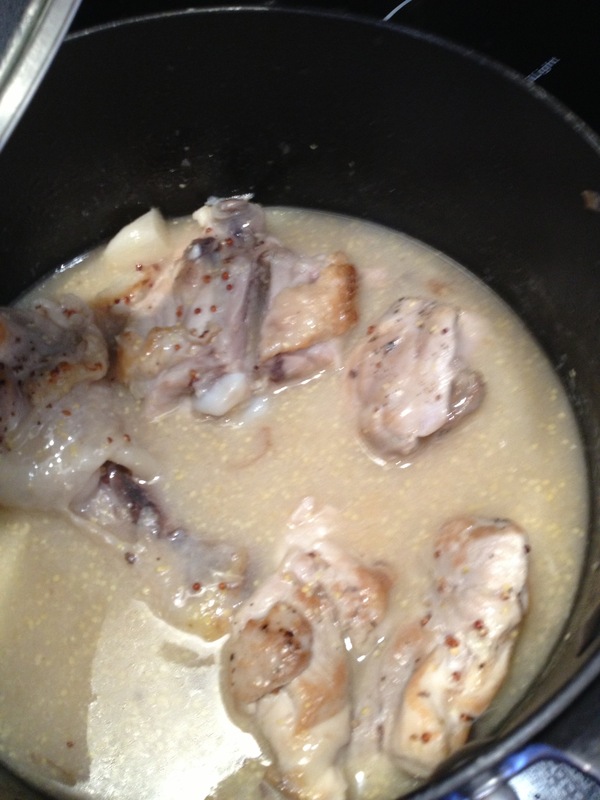 Mix together the chicken stock, white wine, mustard and lemon and keep aside. Heat 2 tbsp olive oil in a deep non-stick saucepan and fry the garlic for 2-3 minutes until the cloves turn slightly brown. Keep aside. Season the chicken with salt and pepper on either side (I had both boneless and boned, so use whichever you prefer) and fry for 2-3 minutes on each side in another 1 tbsp of olive oil until they are slightly browned. Then, add the garlic back in with the sauce mixture, cover the saucepan and let simmer for 10-15 minutes or until the chicken is cooked. Garnish with parsley and serve! Goes well with pasta and/or salad. Delicious and so easy!